I’ve gone to the dogs. By which I mean, dogs keep wriggling their way into the my fiction. If you’ve read Accidental Child, you know that a beagle named Otis figures significantly in the opening scene when he lunges to chase ducks and pulls his owner off balance. She falls and wakes up in another time and place. We go on from there with her grieving over the loss of her child, her lover and her dog. There are dogs running around in the sequel. First, there was Alice, a rescued cattle dog meant to teach a young child the meaning of adoption. Alice was smart and devoted, just what the kid needed. Now along comes Tillie! She is a Belgian Malinois. More than a replacement for Alice, who has gone “over the rainbow,” Tillie is a highly trained personal guard dog, about whom the girl argues with her parents. She doesn’t need guarding and for what they paid for Tillie and her extensive training, they could have rescued half a dozen dogs. But of course, Tillie wins her over and, while they don’t live happily ever after, they do survive. And there’s Angus, a lab-like mutt who steals hearts and sandwiches and there’s Little Smudge, of no particular denomination, needing a home, like so many outliers, and our girl has to help him find safety, warmth and a bowl of good kibble. 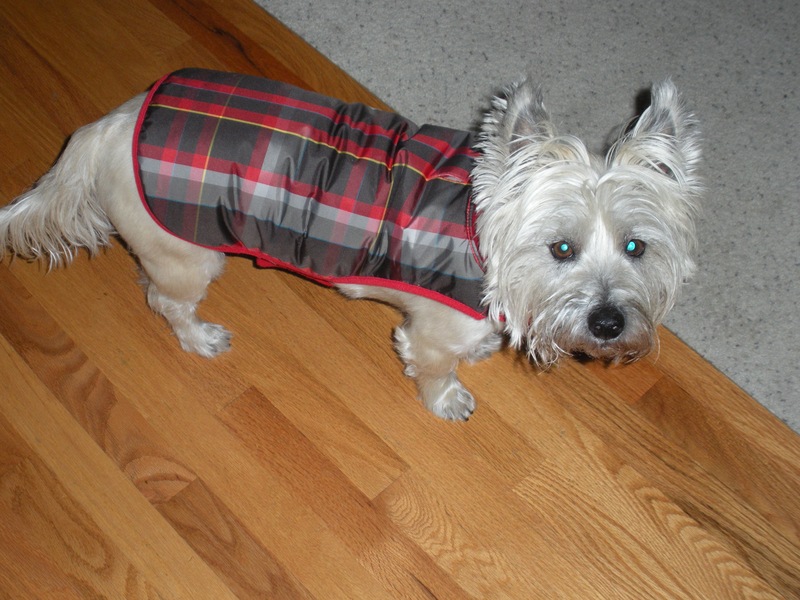 Duncan in plaid w/glow-in-the-dark eyes. I confess, we have three dogs in our house, a Corgi (queen of the world who must have heard that her kind belongs at Buckingham Palace), a corgle (half Corgi, half beagle, half manic–yeah, she’s a dog and a half) and a Cairn (my famous constant companion and house alarm, Duncan). For years I was a horse person, even wrote a book about my beloved gelding, but it seems I’ve caught canine fever. Is there a cure? If so, don’t tell me, please. I’d have to edit out this pack of dogs and I don’t think they would leave without a fight. This entry was posted in Uncategorized and tagged beagle, books, corgi, dogs, literature, malinois, terrier, writing life.